You know when you have been eating really rich food for some time, and then all you fancy is a bowl of very simple soup? Well, that’s a little how I felt after sewing all those colourful clothes for my holiday, I craved sewing something in a more soothing colour. Also, I realised that I actually don’t have a go to LBD. As you can see, it would lend itself very well to colour blocking, and I had already seen some great versions of this dress (including some brilliant striped renditions). This dress really is wonderfully simple to sew….it’s a pull on dress so no zips, and the sleeves are set in flat before sewing up the side seams. BUT the pattern is designed with around 2 inches of negative ease in it….it is designed to be quite a close fitting dress. So if you know you won’t be comfortable in a close fitting knit dress you either have to cut a larger size, or add additional seam allowances so you can fit whilst sewing. 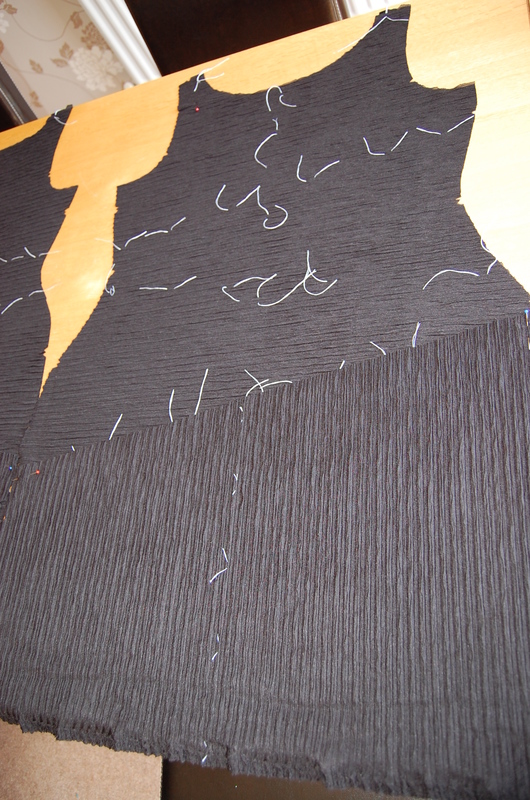 Taking flat pattern measurements and comparing them to your own measurements is crucial to getting the right fit. I would really recommend reading Marcy’s own blog and also Communing with Fabric’s blog (she did a great striped version) to understand the whole fitting thing. Some sewists have chosen not to sew the bottom most shingle on to their base dress. I decided to do this because the pattern has you leaving the cut edges unfinished, and I decided to cut the bottom most shingle using my selvedge as the finished edge. I also cut my sleeves using the selvedge to finish them. What about my fabric? Well, I purchased this fabric from an amazing new ebay seller that I found. They have an ebay shop which has a fabulous selection of knit fabrics….expect to see me sewing more items with other knits that I purchased from this seller! In case anyone wants to visit their shop it is called Click Fabric, and you can click on the link to visit it. The fabric I used is this one, and there is still stock left. It sells for £4.99 a metre and I used around 3 metres to make this dress….a complete bargain I say. Be warned: it is a double layered stretch fabric (which has just under the recommended stretch allowance for this pattern I would say), which means the dress has got several layers in it (perhaps not what I will be wondering round in during the current heat wave we are having), but it is a beautiful quality fabric with a great texture and is very flattering. There is also this great sage green colour which I think would look amazing sewn up in this dress. Love the finished dress! Love the shape it gives you. Very flattering with the shingles. Nothing to dislike really. Ribbed textured jacquard stretch jersey fabric. According to the flat pattern measurements the back waist measurement was about 2.5 inches to long for me, so I shortened accordingly. This meant I had to redraw the placement lines on the back piece to match those on the front. I still have some slight gathering in the mid shingle piece (which I did not alter). If I sew this again I would want to adjust this. I added about 3 inches to the length. Yes I might sew this again. I have seen some great summery versions of this dress, but it would also work very well for winter. Yes, I would recommend to others. WOW that is fantastic. my favorite version of this pattern that I have seen. What a great fabric choice. You look so good. and you have convinced me, now I need to get this pattern 🙂 great fit. Thanks Beth. Yep, this is one of those patterns where I don’t think the pattern envelope was all that, but the versions I saw flying around convinced me. And it is one that you can do a lot with, depending on fabric choice! Highly recommend. First, Goodbye Valentino’s striped dress. Now your textured solid. I don’t know if I will be able to resist this pattern for long, LOL! You look fantastic and it does the most for your curves in a GREAT way. Total win! That is one fantastic dress. It’s incredibly flattering on you. I’m pretty sure I’m going to have to get this pattern for myself. (Your “shingle” matching is spot on too). Thanks Sam. Yep, get it. I think you will look amazing in it! Simply stunning! You did it again! Wow! 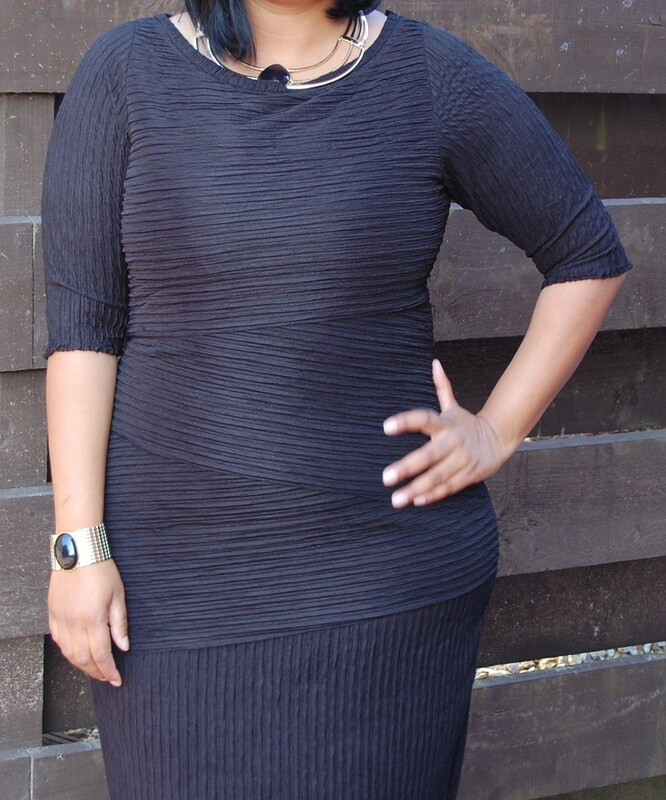 This dress is sooooo flattering on you! What an awesome choice of fabric to use for it. The dress is just stunning and you did an amazing job! I totally love the dress and the fabric seams fantastic. I never buy fabric online coz I always want to see it, feel it first. You may have convinced me to try online fabric shopping once. Also the pattern is amazing. It looks beautiful on you, very elegant. In my opinion this pattern will look better on curvy women then on very slim ones.You did a great job! Thanks jhuly. My experience of buying fabrics on line is largely positive. Sometimes you have to be brave! This looks amazing on you! I’ve just ordered this pattern in the sale and am waiting for it to arrive. Gorgeous!! Thanks Liz. I am sure your version will turn out fab! I wouldn’t have thought about buying this pattern at all with the look on the pattern paper, but what you did with it is just awesome. I live in the US. So i’ll wait for the sales to run again and buy it, one just finished last week. Awesome job !! You and your LBD look wonderful. I might have to try that pattern. I just love your dress. That fabric looks amazing and the dress looks amazing on you! I have to have that pattern now! You did a beautiful with your LBD. You always make the most stylish clothes, and they look great on you…fit perfect! I absolutely love this dress! Great looking dress! I just received the fabric I ordered to make this dress yesterday. I like all the versions I have seen of this pattern. So pretty! Your fabric choice is perfect for this pattern and it fits you beautifully. Did you finish the edges ? Thanks Sarah. No I left me edges unfinished. Used the selvedges for the bottom shingle and arms. The pleated fabric disguises any potential curling. You / the dress look/looks fantastic. The fabric you chose is perfect. Great job!! This is amazing! i almost bought this pattern a week ago but decided against it. You have changed my mind! Wow, I love your dress! It’s beautiful. Great job! I absolutely LOVE your version of this dress! I was already convinced by Sarah to make this dress, now it is at the top of my list! Wow! This is SO fabulous! What a perfect little black dress! It’s smokin’ hot! This looks amazing! I love this as an LBD. Perfect in every way! You look amazing and you always inspire my sewing. Wow amazing dress- you look gorgeous in it! Definitely on my ” to buy” list now…. Great dress! I love the fabric you chose for the dress. This is the 2nd blog I have seen with this pattern, I was tempted with the first on (a blue and white stripe) but now I am in no doubt! What a stunning dress!! and you look amazing in it. Well done! I am so glad that I found your blog (via the Vogue feed on Facebook). You make such wonderful clothes. I am really looking forward to going through your archives and watching what else you come up with! I’ve made this dress too – http://thornberry.wordpress.com/2013/05/28/vogue-8904-the-shingle-dress – and love it – and actually, I have another one cut out! If it looks half as good on me as yours does on you I’ll be very happy. Stunning! I have had this pattern for several months and haven’t been either able to find the right fabric, nor had the guts to try it! Now you’ve really inspired me. Thanks for blogging! Love how you used vertical stripes on the sleeves and bottom shingle. Dress looks great on you. Enjoy! Beautiful dress and you look great. Nice job. You look fabulous in this dress! It is so flattering. Your sewing is beautiful. Thanks for sharing. Great job! The lines in the dress hit you all in the right spots – fits perfectly. The fit is spot on! I really love the fabric you chose for this, too. So lovely. I have never seen this pattern, and now it’s at the top of my want list! WOW. Amazing work. And it fits you like a dream! You look FABULOUS in that dress…and your sewing…impeccable! LOVE it! You look awesome in this! Thanks for sharing!